We believe that health is our most valuable asset and are dedicated to creating a relaxed and friendly environment for individuals and families in Chifley, Woden, Weston Creek and the Canberra Region. 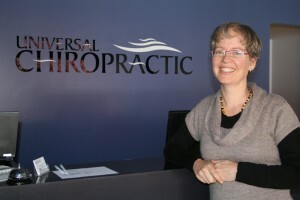 Universal Chiropractic was established in 2005 to provide chiropractic care and health information to families and individuals to assist them in making informed health choices. With over 15 years experience working as a chiropractor and now a mother of three, Dr Kathy Knight (chiropractor) is interested in and experienced with pregnancy and children. She is certified by the International Chiropractic Pediatric Association and is certified in the Webster technique which was specifically developed to assist pregnant women. At your first appointment, we will assess your concerns and tailor an individual treatment program to help you get back on track. To schedule your private appointment with Dr Kathy (chiropractor) call our Canberra office on 0411 125 637!